It's time to bring back one of our most popular light recipes: Baked Skinny Mac & Cheese! Everyone loves Macaroni & Cheese, a perennial comfort food favorite. But not everyone loves the extra calories, carbs, and fat in traditional recipes. 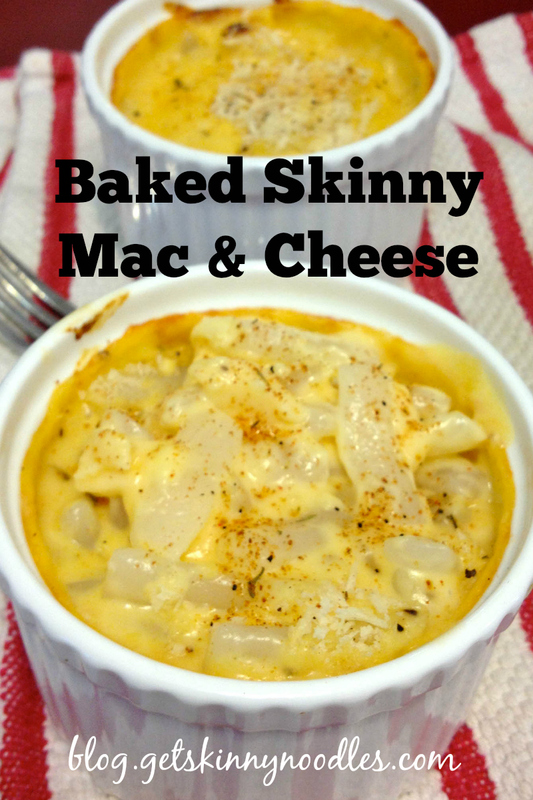 Enter our version made with low carb, low calorie Skinny Noodles Macaroni. This macaroni-shaped shirataki noodle is made from the Asian root konnyaku (konjac). Konnyaku is naturally low in calories, low in carbs, and a good source of filling fiber. Food made from konnyaku has been eaten for hundreds of years in Japan. Noodles and "rice" made from konnyaku flour instead of wheat or white rice are an excellent, healthy alternative for those who are trying to lose weight, or those following a diabetic, gluten-free, or vegan diet. In addition, Skinny Noodles are made the traditional way -- with no soy or tofu -- which makes them suitable for those who eat clean, following a paleo diet. Preparation Tip: Shirataki noodles are most often packed in natural alkaline water to keep them fresh and ready to eat without preservatives. When you open the package, you'll notice an ocean-like scent. Don't panic! To neutralize the scent instantly, drain the water and rinse well, adding a few drops of white vinegar (or lemon juice) to the rinse water. Then pat dry with a clean towel and pan fry for 2-3 minutes until the noodles "squeak." Voila! Low carb, low calorie noodles or "rice" for your favorite recipes. Try in soups in place of regular pasta or white rice to cut about 200 calories and 40 grams of carbs per serving. Also you can add shirataki noodles or shirataki rice to slow cooker recipes during the last 20 minutes of cook time. Makes 4 servings (or 8 side servings).